My earliest ancestors were called St. Hubert Hounds and they worked as stag hunters in Britain as far back as 1066. My entire family has unbelievable scenting talent. I could tell you story after story about how I have helped law enforcement authorities track down fugitives from justice, but you have probably read about it in the newspaper already. Don't misunderstand � I am not an �attack' dog. I just do my job, which is to find the culprit. Then I turn him or her over to the proper authority. Not to brag, but my scenting ability is so keen that my identification of a scent has been accepted as fact in a court of law! I don't want to leave you with the impression that I am only useful as a scent hound. I am also a good, gentle family pet with a hankering for the country life. When fully grown, I am between 23 and 27 inches tall (58.4 to 68.6 centimeters) and I weigh between 80 and 110 pounds (36 to 49.5 kilograms). 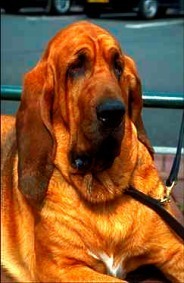 We have no Bloodhound Breeders listed at this time. Click here to place your Bloodhound Ad!